Happy Friday dear friends! I can hardly believe we are at the end of April already!! Seems like the month just flew right on by. In just a few short days, it will be time to celebrate those women who are so very special in our lives. I love Mother's Day and all that it entails!! It also means that my kids will either come home or call me at some point in the day and I look forward to spending time with them!! I'm so sad to say that my mom is no longer with us, but each year I make a card in remembrance of her! 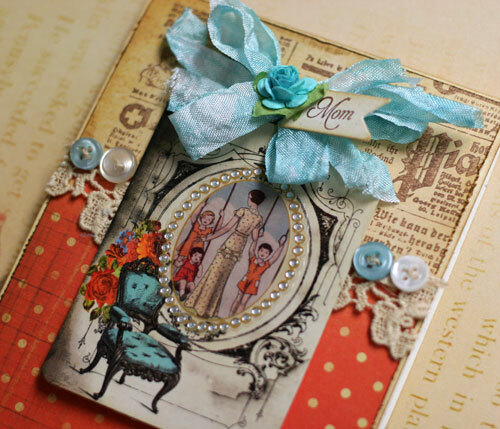 I was excited to design some Mother's Day cards with Glitz Design's Laced with Grace Collection! What a gorgeous line of papers!! 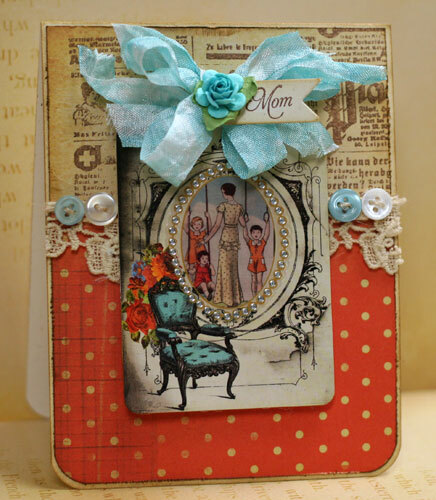 So perfect for Mother's Day cards, or any type of card for that matter!! I died some seam binding with Tim Holtz Tumbled Glass Distress Reinker and added some blue buttons to enhance the blue in the chair. I also layered a Laced with Grace Glitzer on top of a Laced with Grace Whatnot and I love the combination! Glitz Designs embellishments are so fun to work with and give you so many possiblities! 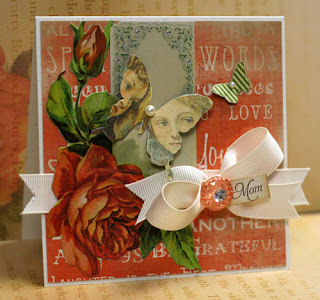 other supplies: Papertrey Ink Vintage Cream CardstockPrima lace, Hug Snug Seam Binding, Tim Holtz Tumbled Glass Distress Reinker, Tim Holtz Brushed Corduroy Distress Ink, Papertrey Ink buttons and twine, Papertrey Ink stamps: Tiny Tags, Papertrey Ink Double-Ended Banner Die. The next card is very simple and easy. It will take you all of 2 minutes to put together! I think the whatnot word collage sets the tone of the card and the rest just falls into place! I layered some cardstock with a Laced with Grace Whatnot, added some ribbon then attached a Laced with Grace Journaling Sticker over the ribbon. I added a Laced with Grace Glitzer, cut out and attached some butterflies and added some jewels and a bow. 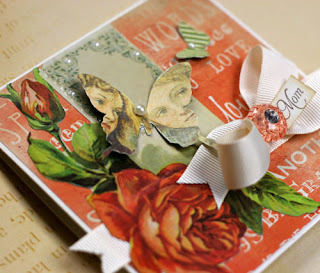 Other supplies: Webster's Pages Sparklers, Papertrey Ink Vintage Cream Grosgrain ribbon, Kaiser Craft Pearls, Tim Holtz Brushed Corduroy Distress Ink, Papertrey Ink stamps: Tiny Tags, Papertrey Ink Double-Ended Banner Die. Wishing all Mother's everywhere a Happy Day!! You are so very special!! Gorgeous!I am eagerly awaiting all my Laced With Grace to arrive in the mail. Beautiful! I love them both!! :) Great work!